This Karwa Chauth, choose from any of these 5 dramatic eye makeup styles and look gorgeous on this special day! The great and grand festival of fasting, that is Karwa Chauth is here, and it’s time to gear up for a day packed with fasting, dressing up and having fun with the ladies. And along with your stylish outfit for the daytime as well as evening, it’s time to show off your makeup expertise as well. To help you out, here are 5 dramatic eye makeup tutorials to flaunt on Karwa Chauth as well as on Diwali and impress all your friends by looking your very best. Start by applying primer on your eyelid and then add a layer of foundation to create a good base for the makeup. Take a lighter silver shade and apply it on the inner corner up till the middle of the eyelid. Next, take a darker shade or silver, or opt for dark grey and apply it from the middle of the eyelid to the outer end. Blend the two shades together using a blending brush or your fingertips. Now take a charcoal grey and add it to the outer corner and blend it in. Apply dark strokes of black kajal on the waterline and dab some sparkling white eye shadow below the brow bone. Lastly, draw a defined stroke with eyeliner on your eyelid and finish off with mascara. This is a beautiful and very dramatic makeup style. Using your regular kajal pencil, draw a horizontal line along your crease line and add a flick at the outer end. 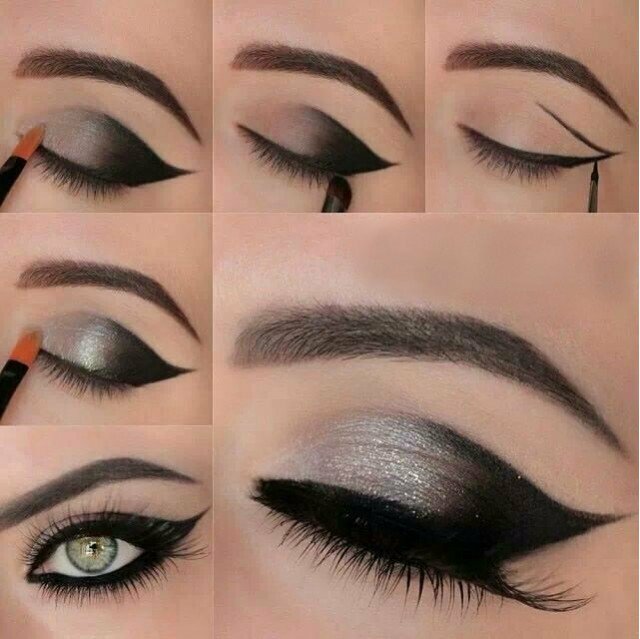 Draw a line from the outer corner of the eye upwards to join the flick. Then using a gel eyeliner, fill up the space created by the lines. Use a thin brush to fill up all gaps. Draw a thick line along the bottom of your waterline as well. Now use a matte finish white eyeshadow below your brow bone. Take some glittery gold eye shadow and lightly apply it on the black area. Spread it evenly with your finger and voila, you have a stunning and shimmery effect. This look combines metallic gold and silver eyeshadow to create a dazzling effect. Start by applying a metallic silver eyeshadow on the inner corner of the eyelid. Then apply gold eyeshadow to the centre of the eyelid and apply a metallic black or grey to the outer most corner. Use a small blending brush and blend each of the shades into each other to create a seamless effect. Apply a dark stroke of kajal to your lower waterline alone and finish off with two coats of mascara for a striking, dramatic effect. If you are planning to wear lehengas or salwar suits in shades of green or turquoise, then this look is for you. 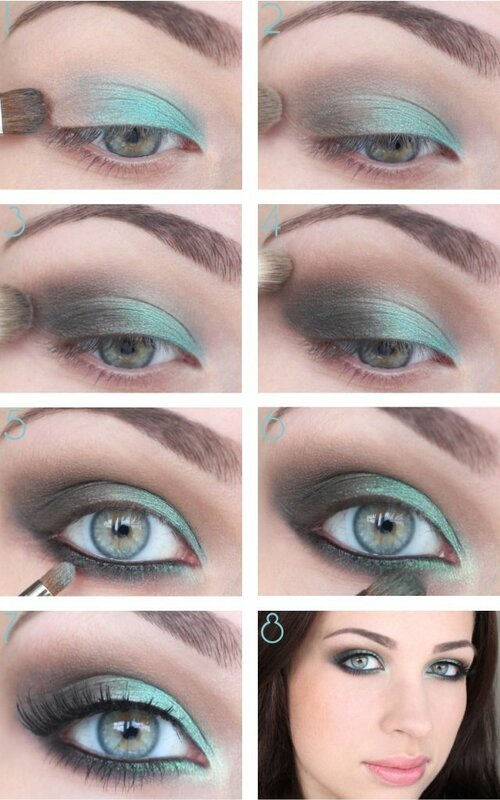 Start by applying a shade of matte green eyeshadow from the inner corner of your eyelid to the centre. Keep the color darker towards the inner corner and make it lighter as it moves outwards. Next, use a light grey shade and apply it from the centre of the eyelid to the outer end and blend the two colors together. Apply a shade of brown along the crease of the eyelid and blend that as well. Next apply a light shade of gold on the inner corner of the eyelid to make your eyes pop. Apply the eyeshadow in similar gradients below the water line as well. Apply a thin stroke of kajal and eyeliner and finish off with volumizing mascara. Using a thin brush, apply a stroke of eyeliner along the upper lash line. Extend this line out further and then move it upwards towards the brow to create a shape of V. Fill in with black liner at the point where the two lines meet to form the V. Then apply a grey shadow in the centre and blend it in. Next, apply a silvery shadow till the inner corner of the eyelid and blend it together. Apply a stroke of kajal to your waterline, dab on some mascara and you are all set to be the centre of attention at the grand Karwa Chauth celebration.